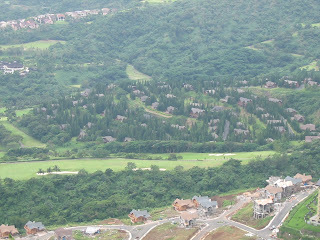 Last Sept. 8, 2009 was my first time to visit Tagaytay City. I went there with hubby and other Pastors from Cagayan de Oro to attend a seminar and a Graduation program. It was an exciting trip as almost all of us were also new to that place. We took a bus ride in going there. Most of the time it would take 2 hours to reach Tagaytay, but because of the heavy traffic it took us 3 hours to come to the destination. The bus ride from EDSA Taft to Tagaytay costs Php 87.00 only. I don’t know if this is expensive or not. It was raining and windy when we reached Tagaytay City. The atmosphere was very cold even while inside the place where we are staying. Our team leaders reminded us to bring jackets because the place is really very cold. On the second day of the seminar, we were scheduled to have a City tour around Tagaytay. Unfortunately, I wasn’t able to come because it was raining very hard. I was praying that on the third day the sun would come out and smile to all of us. God was indeed faithful and Mr. Sun showed up. Since there was a 3 hours vacant in our schedule in the afternoon, hubby and I decided to have a quick tour around the city. We just decided to go in one place because we don’t have enough time. We only went to “People’s Park in the Sky”. We took a “tricycle” in going there where it costs us around Php 200 for the round trip ride. If you find the fare expensive, you can make bargain with the driver. 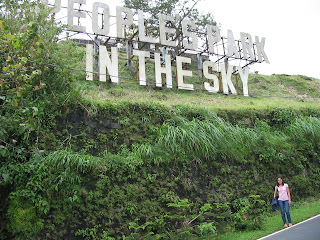 The Park was a nice place where you can have an overlooking view of Tagaytay. Entrance fee to the park is Php 15.00 per person. According to hubby, the place was different 10 years ago where it was still beautiful. Nowadays, the park wasn’t taken cared of. My hubby’s aunt told us that only a few are now visiting this place. Most of the tourists went to the “Picnic Grove” where there are a lot of exciting adventures available in there. I also wanted to go there but our time is limited. My hubby’s aunt promised to tour us around Tagaytay if ever we can go back to Manila. She would also tour us around “Tagaytay Highlands” one of the nicest place in Tagaytay. Hmmmm… this sounds exciting. I hope to be back soon. sayang! wala mo ka tour because of the rain. Pero its okey there is always next time. lol!